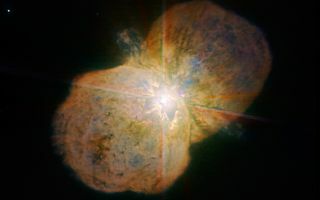 This new image of the luminous blue variable Eta Carinae was taken with the NACO near-infrared adaptive optics instrument on ESO's Very Large Telescope, yielding an incredible amount of detail. This cool space wallpaper of the luminous blue variable Eta Carinae was taken with the NACO near-infrared adaptive optics instrument on ESO's Very Large Telescope, yielding an incredible amount of detail. The images clearly shows a bipolar structure as well as the jets coming out from the central star. The image was obtained by the Paranal Science team and processed by Yuri Beletsky (ESO) and Hännes Heyer (ESO). It is based on data obtained through broad (J, H, and K; 90 second exposure time per filters) and narrow-bands (1.64, 2.12, and 2.17 microns; probing iron, molecular and atomic hydrogen, respectively; 4 min per filter).